Before buying the Roman Duo DeliCooker HL-400 (S$1288 including 7% GST & delivery) from New World Home Care Pte Ltd in Singapore during the "My Home Grand Furniture and Reno Spring Expo 2014" exhibition (22 March 2014 to 30 March 2014 at Singapore Expo Hall 7), I had searched the internet & found a Veees Duo DeliCooker HL-400 from Malaysia that had exactly the same design, outlook & specifications. The only different is the name: Roman (selling DeliCooker in Singapore) vs Veees (selling DeliCooker in Malaysia). You cannot use the normal wall or power socket (13 ampere) that is found in Singapore because the high 18 Ampere current consumption will blow the fuse and cut off the power supply.The high 18 Ampere current consumption for the Roman Duo DeliCooker HL-400 is needed to provide enough heat to cook the food. If you want to buy the Roman Duo DeliCooker HL-400, you will need to pay for the electrical works to connect a new wiring from your home circuit breaker (advisable to use the spare 20A circuit breaker only for the Roman Duo DeliCooker HL-400) at a cost of around S$80 (no drilling) to S$120 (with drilling). As my home had installed the kitchen door, the electrical wiring (S$120) will need to drill a hole through the kitchen wall in order to lay the wiring & installed the 15A wall or power socket. Living room 13 ampere wall socket is P18. 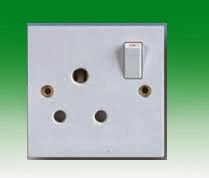 Kitchen 13 ampere wall sockets are from P19 to P22, P24 to P25. Service yard 13 ampere wall socket is P23. As the P22 13 ampere wall socket in the kitchen is the nearest to the Roman Duo DeliCooker HL-400, I change the P22 13 ampere wall socket to a 15 ampere wall socket with round-pin type. This eliminate the need to pay the contractor to connect a new wiring from my home circuit breaker to the kitchen. I have to ensure that the 13 ampere wall sockets (P18 to P25) are not all fully use up during cooking in order not to overload the 32A (B32) MCB. The Roman Duo DeliCooker HL-400 wire (slightly thicker than normal 13A cable) length is around 1.8m (excluding the plug) and is not-detachable type. The wire is locates underneath the DeliCooker at around the lower Left Hand Side (LHS). After deducting about 40 cm (0.4m) width of the DeliCooker, the wire length has left around (1.8 m - 0.4 m) 1.4m to connect to the wall or power socket. You will need to consider the wire length if you want to install the Roman Duo DeliCooker HL-400 as built-in type where the vendor recommend cutting dimension is 67 cm (Length) x 40 cm (Width). I am contemplating to get the HL400 for my new place but I'm uncertain about the usability since we have been using gas hob for years. If it's not too much of a trouble, will you be able to share your experience using the hob, the pros and cons, and whether it will incur a considerable amount of electrical bill? [Jack] As our deli cooker is not very heavily use, eg: boiling water, cooking only on Sunday, heat up food, etc, my home electricity & water bills total amount is around $70 to $80 per month without air con usage. We switch off the deli cooker when not in use. Hence, electricity bill seems normal to me. The deli cooker buttons sometimes need to press a few times in order to get it working properly. After cooking, we normally open the bottom cabinet doors to dissipate away the heat that generated from the cooker. I just wonder if the food gets cooked faster as compared to normal gas stove. And whether soup or water will over spill easily as the heat can be quite strong. Having used the vitro-ceramic for a few months, do you feel this is a better option or investment as opposed to gas stove? [Jack] The heat from the deli cooker can be controlled (9 is maximum heat being generated & 1 is the lowest heat being generated). Instead of turning the knob on traditional gas stove, you press the up or down Power touch button to control the number that represents the generated heat output. Each deli cooker cooking glass surfaces come with its own Timer Automation function that can automatically switch off that cooking glass surface after your specific set timing. Traditional glass stove did not has this Timer Automation function. Easy to clean the deli cooker because the whole surface is flat. Save the hassle of laying gas pipes in your kitchen. Safer (using 15A fuse and 32A miniature circuit breaker protection) as compare to traditional gas stove with gas & flame. However, if power supply break down, then you cannot cook. You will also need to buy flat surface cooking ware to make full use of the flat surface heating area. These cooking ware in the market have limited size. Hence, you cannot cook huge quantity of food at one time. Hi Jack, Im an active cooker. I cook at least 2 times a day for lunch and dinner. Do you think using this ceramic hob is cheaper than using gas stove? The marketer of the ceramic said they are cheaper than gas (expected). then again marketer always a marketer right? Thx for your sharing. Sorry, as I do not have a gas stove, I cannot compare and conclude whether the electricity usage is cheaper than the gas usage. Repair too costly, and have to bring back to company to find out whats the problem.Price quote: $ 280/.